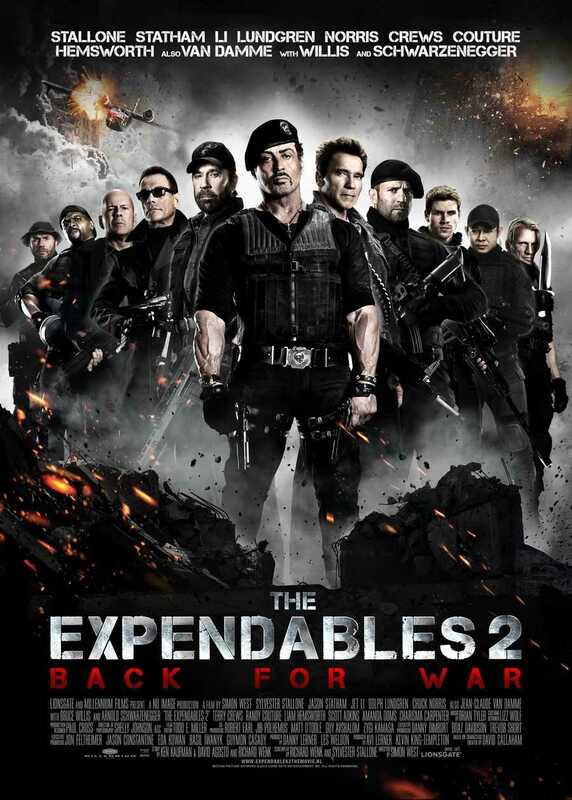 When I saw Expendables last year, I had a lot of fun with it. It’s a simple and straightforward action film, very typical of the genre. Its simplicity is what entertains, regardless of anything else. Going into Expendables 2 that is exactly what I expected of the film, even though it has a much bigger ensemble cast, given that some of the biggest names of action films from the 80s and 90s got together to make this. At its core, Expendables 2 is a very typical action flick, being all about revenge, big-big explosions, bullets flying here and there, and dramatic showdowns between the heroes and the villains. “Boys with toys” is a fair description of the movie as far as I’m concerned. There is some lovey-dovey stuff here with Lee and his girlfriend, with Billy and his girlfriend; there is lots of emotion stuff from the various heroes after the death of one of them, lots of tongue-in-cheek dialogue (where Chuck Norris and Arnold Schwarzenegger are concerned) and in the end, there is ample badassery (insert random Chuck Norris factoid). I guess what I’m really trying to say here is that I had a lot of fun watching the film. I know a lot of people (especially in my circle of friends) have said that it’s a dumb action flick with cheesy performances from most of the cast. Well, so what? Going into the movie, I knew and expected that the film wouldn’t go into any deep, subtle imagery and allusions, that it would be remarkably straightforward and be hitting the checklist of “summer blockbuster”. Plus the fact that with such a huge cast, there wouldn’t be so much time spent on many of the characters and I was totally fine with it. With movies like this, I think that it is a good thing to look at them on their own merits and not be overly critical as we might of something on the other side of the spectrum, such as, say, the Transformers movies. So, going with that, what all did I like about the movie? Well, the ensemble cast would be at the top of the list. Stallone, Statham, Schwarzenegger and Willis are some of my favourite actors in the action genre, and seeing them all in the same scenes was very thrilling. That’s a lot of badassery compiled together. It really doesn’t get any better than in my opinion. The fact that they are joined briefly by others such as Chuck Norris, Jean-Claude van Damme and Dolph Lundgren, is icing on the cake, although I’m not really that familiar with Norris’ work outside of a few Texas Ranger episodes over a decade ago and the only performances of Lundgren’s I’ve ever enjoyed are the Rocky film he did with Stallone and Expendables (Punisher and Masters of the Universe were entirely terrible). Going back to the quartet, each of them delivers a very honest-to-themselves performance that is reminiscent of their own best work. In case of Schwarzenegger his dry-sarcastic Trench was a perfect role for him, coming as it does just as he reenters Hollywood. In pretty much every scene he is in, whether he is getting beat-up on the head with THIS HURTS REALLY BAD, or when he is unintentionally rescued by the Expendables, or when he is beating the living daylights out of the bad guys with big honking guns in each arm, he is a gem. He reminds you why he was an action superstar back in his day and that he still has that old charm. I’m really looking forward to The Last Stand now. With Stallone, it’s nice to see him as the old, tired warhorse who is looking for a way out but is too comfortable where is since he doesn’t know anything else. It was a nice whimsical touch to the character of Barney Ross. A lot of the emotional scenes involve him ruminating on his life so far and where it is headed, as well as dealing with those who are lost along the way. I haven’t seen the most recent Rocky movie, but I believe that it shared some of these same themes as well where Rocky Balboa is concerned. Jason Statham, well, that man is lethal to the core. Great witty dialogue, perfect action scenes, and getting the girl in the end. He’s made some ridiculous choices in his career recently, such as Safe, Crank 1 & 2, The Mechanic and Dungeon Siege, but with Killer Elite and the Expendables movies, he is on the right track I think. His action scenes are always the best and it shows here too, whether it is him manning a mounted gun on an army-grade humvee or knifing to death a dozen bad guys in a matter of seconds. And finally, Willis. I haven’t seen much of his recent stuff, other than Red and Live Free or Die Hard, but he is still one of the best out there in the business, even though his age shows, like it does for the other senior cast of the film (van Damme and Stallone I’m looking at you!!!). Suave, controlled, precisely lethal, that’s what CIA Agent Church is in this movie, with that hint of IMMA-SCREW-YOU-UP to him like any good mysterious character in an action flick. He has few scenes in the movie, but he does great in them. I really should get around to watching more of his work. Speaking of which, I’m cautiously excited about his Joe Colton, the original G.I.Joe, in G.I.Joe Retaliation. With the others, they all in turn a good performance, although Couture and Crewes are mostly neglected from anything significant, especially when compared to the satirical charm of Chuck Norris’ Booker whenever he makes an appearance, or van Damme whenever he is doing his villain stuff (he is even named Vilain!). To be honest, I expected a lot more of van Damme in terms of his action scenes as I don’t think the final showdown between him and Stallone does either of them proper justice, but it is what it is. Expendables 2 is certainly miles better than Universal Soldier: Regeneration, which was absolutely damningly terrible as a movie. I wonder if age really is that much of a factor. Willis and Schwarzenegger carry it really well, but he and Stallone don’t, not really. Standout mention here for Yu Nan as Maggie Chan, one of Church’s (Willis) people who is sent with the Expendables on their recent mention to retrieve a very special lost safe which ultimately falls into Vilain’s hands and all sorts of hijinks ensue. Her character was a bit trope-y but Nan delivers a decent enough performance. Her scenes with Stallone when they are all hiding in a former Soviet training facility are the best. The whole ensemble cast idea has really worked out I think for Simon West and Stallone. There is a good enough camaraderie between all the characters, even Vilain with the heroes, and they all come together rather nicely here. Everyone has something to offer to the script and to the fans, and to be honest, it couldn’t have been any better really. A few tweaks here and there perhaps but overall the movie works really well. Expendables 2 is no Black Hawk Down but for Simon West it is another feather in the cap. The movie has also done really well for itself, raking in over 100% revenue beyond the budget. West’s direction is also pretty good, in the same vein as BHD or Lara Croft: Tomb Raider so I’m happy with it all. This is the movie I went to see, and I got what I wanted out of it. I could comment some more, with regards to say, the pacing or the various locales, or what not, but then I’d just be adding more gravy to this review. Point is, for me this was a great movie and I enjoyed the experience. Bring on Expendables 3 and Expenda-belles!!!! Posted on February 24, 2014, in Movie Reviews, Review Central and tagged 80s Action, 90s Action, Action, Arnold Schwarzenegger, Bruce Willis, Chuck Norris, Dolph Lundgren, Ensemble Cast, Film Review, Jason Statham, Jean-Claude Van Damme, Jet Li, Liam Hemsworth, Lionsgate, Movie, Randy Couture, Review, Review Central, Simon West, Sylvester Stallone, Terry Crews. Bookmark the permalink. Leave a comment.